November 7, 2013 - On Tuesday about 12:50 PM a chronically ill California man, Greg McFadden, 61 had gone up in a helicopter for a 30-minute scenic tour of the Southern California coast provided by Cardinal Air Services located at Fullerton Municipal Airport, Orange County, California. What was to be a normal flight turned into any thing but normal. 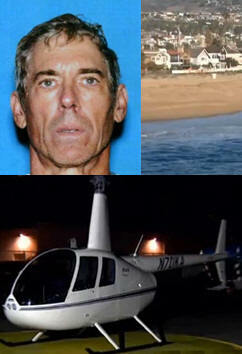 15 minuets into the flight at or about 1,000 feet over Balboa Pier in Newport Beach, McFadden unbuckled his seatbelt, opened the Robinson R44 helicopter door over open water and jumped out to his death. The pilot, Corbin Street, 25 attempted to grab McFadden by the arm to prevent him from jumping from the helicopter but was unable to maintain control over the helicopter and hold McFadden. McFadden had booked the $310 flight for himself and his son, but he was the only one who showed up for the flight. It is believed that McFadden committed suicide due to health issues he had been dealing with for the past 15 years. On Sunday McFadden had booked a scenic helicopter tour for two with OC Helicopters at John Wayne Airport for a Monday flight. On Monday McFadden had showed up alone and hours before the flight. The owner, Ric Webb reported McFadden was dressed wearing shorts, with flip-flops and was carrying a ripped plastic grocery bag. The owner became concerned with his behavior and appearance. Webb said "something was just off about him. I thought it was chemical. The look in his eyes was empty." Webb stated he had spoken with McFadden for several hours and that McFadden appeared anxious and repeatedly asked to go flying, he also requested to fly at 8,000 feet. Webb stated that McFadden had said “If we don't fly today, I'll never be able to come back here again.” Disturbed with McFadden’s behavior Webb contacted the Orange County Sheriff’s Department and they escorted him off the airport. On Tuesday McFadden booked a second flight with Cardinal Air Services. McFadden brother, Brad McFadden told the news media that his brother suffered from esophageal disorder that prevented him from sleeping at night as the disorder gave him acid reflux which caused him to choke when he went to bed. His brother further stated his bother had been trying for years to get corrective surgery but it kept being delayed by his doctors. McFadden brother said "he was a very good man, he cared for people, loved animals and was a down-to-earth guy." He further stated that McFadden was a loner. McFadden was a graduate from the University of Southern California with a degree in philosophy. His desire was to be a screen writer. McFadden had written several movie scripts but unfortunately he was unable to sell them. McFadden worked as hotel clerk and a travel agent until he became ill and was forced to collect Social Security disability benefits.